This engine was built in Leeds by J & H McLaren of Jack Lane (No 113 of April 1882) and was owned by G & J Stubley Ltd. It was sold by them sometime after October 1891 to Scotland at the time when they bought a road locomotive from John Fowler’s at Leeds. (Information from Leeds and District Traction Engine Club). 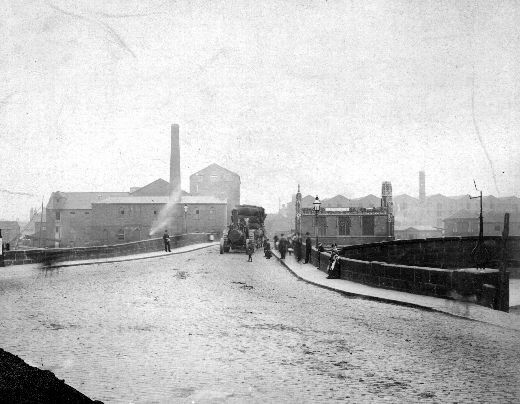 The engine is on its way across Chantry Bridge from Wakefield, with a load of wool bales. G & J Stubley Ltd was established in 1850 by George and James Stubley and was a leading shoddy and mungo manufacturers with processing sites in Batley and Wakefield, West Yorkshire. Sites included Hick Lane Mills & Bottom Mills in Batley and Calder Mill in Wakefield.